- Bloodshot eyes, dark spots around the eyes, and sometimes smelling of substances. - Memory loss and sometimes blackouts. - Relationship issues with the family. If your brother has some or all of these signs and symptoms, then its possible he is suffering from an addiction and needs your help. Without support from a professional, it can be very tricky. Below are a few measures you can take to deal with your drug addict brother. Getting your brother to trust you, and open up about his addiction is the most difficult part of your task. But once the connection is established, then everything else will seem like smooth sailing depending on how far down the addiction pit, he has fallen. How will you establish trust? Well, connection and trust can best be established through honest and open communication. How do you do this? Well, here's a compiled list of dos and dons that you will need to follow to the letter so he knows that you have his best interests at heart. - Talk to him encouragingly. - Let him know you will support him. - Be as kind as possible. - Be consistent with your visits if you don't live together. - Tell him that you care about him and let him feel that. - Don't blame and criticise. - Avoid Yelling and lecturing. Remember, when trying to establish a connection, and throughout the whole process, do not visit him when under the influence of a drug, more so alcohol. You can also use a family member whom your brother loves or respects a lot in the communication. Update Him on Treatment Options. Now that you've earned his trust talk to him about various treatment options that can help him overcome the addiction less threateningly. Also, try to persuade him to examine one of the therapy options. But just because you created a connection with him, does not mean he will accept your request to join therapy immediately. As long as it takes, donâ€™t give up but lovingly persuade and show him that he has your support. Once he's entirely convinced, help him choose a therapy treatment that will best suit his addiction. Your hardest part is over now that he has accepted to seek medical help. His tough journey is now beginning, so he will need all the support he can get. You can have a few family members attend some of the therapy sessions with him especially during the detoxication process. Finally, find him a self-help group with former addicts and where possible, a professional counsellor. Offer as much emotional support as you can and help him cut ties to anyone or anything that may trigger a relapse. 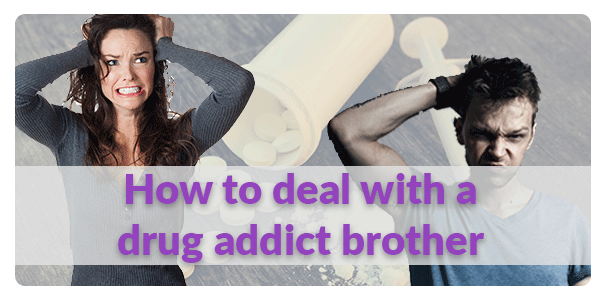 I hope these few steps on dealing with a drug addicted brother will be of help to you. Remember, as much as it's important to respect your brother's privacy. You are still family and should do as much as possible to help.